But while you might be joking when you think that at the wheel of your frozen-solid flat-battery banger on a frosty winter morning, there’s some truth to it too. In many cases, the scrap car value can make it much more economical to replace a clapped-out old motor with one that will actually turn over on a cold day. 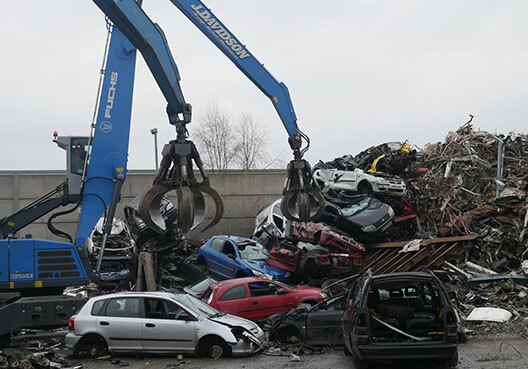 At J Davidson we’ve recycled many a scrap car in Manchester in previous winters – and helped their drivers to unlock that scrap car value to put towards a new motor. So how do you know when your car is on its last legs? Well, every car can suffer from a flat battery if you leave the lights on or if you haven’t driven it for a while, but cold winter mornings make it much more likely. • The ignition turning over for longer before the engine starts. • Regularly needing a jump start or a battery booster to get going. • Winter weather inside the car. Often you’ll get that sixth sense as a regular driver of when the squeaks and rattles your car makes are getting to be less of its ‘character’ and more of a cause for concern. And it’s not just the engine, either – if you feel like the suspension or steering are going, you could be looking at a costly repair when it is often far more economical to scrap a car and replace it with a new one, or even a used model in decent condition. What happens when I scrap my car? J Davidson can handle everything – we’ll take your car away, pay you its scrap car value, dispose of it in a fully legal complaint way, and make sure you get all the paperwork you need to prove that it has been scrapped. This last part is important, as it means you no longer need to worry about being responsible for what happens to the vehicle next – and you won’t face any unexpected claims for road tax or car insurance on a vehicle you thought you had scrapped. We don’t just crush scrapped cars, as there are all kinds of different materials, metals and chemicals in the construction of a vehicle, and they must be recycled or disposed of in the appropriate ways. As such, we will drain the fluids – including any fuel still in the tank, hydraulic fluids, engine oil and battery acid – so that these cannot escape into the environment when the rest of the car itself is taken apart. After that, anything of value that can be recycled is processed, which means that the natural resources like the metals used can be made into new products, which is kinder to the environment and less energy intensive than using brand new metal. For you as the driver, this gives you peace of mind that a much-loved motor will continue to do some good even after it is scrapped – but without the hassle of being personally responsible for it yourself.